I was recently teaching a musician wellness class for a group of high schoolers (with a few college students/grownups mixed in), and the bulk of the girls were very hypermobile, especially in their knees and elbows. They were also, coincidentally very disembodied and disconnected from their body, as many teenagers (and people) can be. When I explained what hypermobility is, and how to tell if your knees are hypermobile, one girl immediately said "This is how I always stand (knees locked out beyond 180 degrees). Should I not do that anymore? It doesn't hurt." I in turn suggested that she not lock out her knees or elbows, but it reminded me of another side of hypermobility - that of pain, joint dysfunction, and potential damage to the surrounding tissues that may take years to manifest. Aside from hypermobile knees and elbows, many people have unstable wrists, fingers, thumbs, and other joints. I've mentioned hypermobility before, but mostly in terms of fingers that won't behave in the context of music (piano, violin, clarinet, etc). Joint hypermobility syndrome is often characterized by many hypermobile joints, i.e. joints that move beyond normal range of motion. 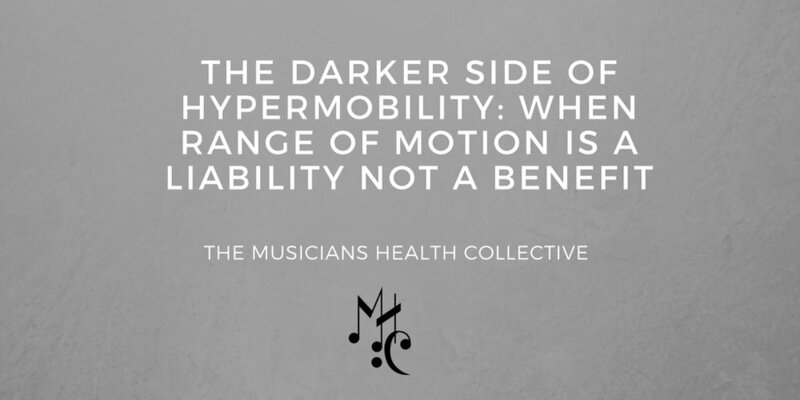 Yet, hypermobility is also a result of inherited (genetic) factors, lack of proprioception (knowledge of the where the body is in space), muscle weakness/strength imbalances, as well as all-over joint instability and susceptibility to soft tissue and joint injuries, as well as pain. It can also be part of a larger diagnosis, such as Ehler-danlos syndrome or Marfan syndrome, amongst others. (*Ehler-danlos syndrome is a connective tissue disorder than can manifest in many other non-hypermobile ways, including internal organ and skin dysfunction). This woman's standing left leg is locked out past 180 degrees, meaning that the joint is not stable and her left hamstrings and calves aren't supporting her weight. In addition, her right leg easily moves to 180 or more degrees, so the result is that neither group of muscles is being stretched but instead ligaments are doing the bulk of the work here. I recently read a very insightful blog in Yoga International, about a woman diagnosed with JHS, working with a wide range of symptoms including joint pain, excessive range of motion, immunity challenges, osteoarthritis, and a host of other health challenges. When someone who is hypermobile loads an unstable joint with weights or body weight, they are not using muscles to hold themselves up, but instead their ligaments are bearing the brunt of the job. Most hypermobile students do not need to stretch their ligaments, although the muscles themselves may be weak and at a shortened resting length. They often instead need to build strength and stability within a joint, rather than continually expanding range of motion. I myself am not particularly hypermobile, but I have seen excessive ranges of motion glorified in yoga, gymnastics, exercise, and other movement disciplines as a "goal." One thing to keep in mind is whether achieving a pose or movement is an aesthetic goal, or a movement goal. Dancers are often hyper mobile, and the attainment of a certain dance position is an aesthetic goal, despite how it affects the body long term, and that's a separate issue. Some of my yoga teachers tell horrifying stories of debilitating pain after yoga classes in which they used their inherent joint instability to "achieve advanced poses" or perform impressive feats, only to regret it later. Even if you're not a yoga teacher or practitioner, it's important to be sensitive to the fact that most people who are hypermobile don't know that they are, and don't know that there's a potential for long term tissue damage and pain, even though pain may not manifest for years (or ever). As musicians, music instructors, and movement educators we have the ability to help our students find their natural joint ranges of motion, strengthen their tissues, and help them in their own journey of kinesthetic learning. I've been totally overwhelmed at the thousands of people who've read my last post, The Darker Side of Hypermobility, and I wanted to offer a part 2 of resources, suggestions, and other very well thought out blogs worth reading on the subject for a large range of movement professionals. There is a ton of material on this subject, and I'm delighted to see so many people interested in supporting their clients through education, better assessments, and more. -Seek a movement professional who can help assess your ROM and identify where you need to stabilize your joints. That may be an Alexander Technique teacher, Feldenkrais teacher, Yoga Tune Up® instructor, Restorative Exercise Specialist, strength and conditioning coach, Pilates teacher, physical therapist, Rolfer, or other professional. -Make your goal to increase proprioception (awareness of your body in space, awareness of your joints), through whatever means necessary. This can be a movement class, a bodywork session, self-massage with Yoga Tune Up®/Melt Method®, etc. -Stop doing whatever is hurting you most, whether that be working with a coach/instructor who pushes you to your limits (or beyond) or a class that praises your "flexibility" as an end goal. -Start addressing your muscle "tightness" (and weakness) issues, and stop using your ligaments to do the job. Self massage is an amazing way to increase proprioception and manage pain. -Seek a medical professional's advice, as to whether your hypermobility is part of a larger diagnosis, or correlates with other issues you may be having with your health. Why You Must Not Stretch Hypermobile Clients, by Eric Cressey. Great overview of ROM challenges in the strength and conditioning space for the hypermobile client. Managing Laxity in Lifters and Athletes by Tony Gentilicore- this is probably one of my favorite blogs on the subject from the strength and conditioning vantage point. Right away, he establishes a major priority (which I agree with) to be "increase proprioception and re-establish proper stabilization of major joints." Teaching the Hypermobile Dancer -this is more science oriented from the vantage point of a British PT, but definitely worth reading. Pilates for Hypermobility- Much in line with the other articles here, this is a general blog on suggestions for pilates instructors. Hypermobility- Keeping it In the Box: A short article on controlling ROM for pilates instructors. Mobility's Dark Side, by Brooke Thomas - Brooke is a terrific writer, podcaster, and movement thinker, and her blog for Breaking Muscle is excellent. WAWADIA, curated by Matthew Remski. This ongoing blog/project/future book is looking at the hard questions in the yoga community, and Matthew has talked about the praise of hypermobility many times. This is just one interview with Diane Bruni in a series of many thought-provoking interviews. Is too Much Stretching Bad for you? by Jill Miller- Jill (and many other YTU teachers, including Trina Altman) has been incredibly open about her experience with joint instability and pain as a result of too much yoga. Jill (and the Yoga Tune Up®) challenges a dominant yoga paradigm of stretching and flexibility as the "goal" of yoga asana. Hypermobility by Katy Bowman- As usual, KB schools the world on what hypermobility really means in general populations, and reminds us that "People with hypermobile joints actually have very (very, very!) tight muscles." Hypermobility, and 12 steps to Stronger Shoulders - Here, Katy Bowman looks at things you can do right now to improve your proprioception, plank position, hanging position, and other hypermobile woes. So You Think You Might have EDS, which depicts the various symptoms of the different types/classes of EDS, and is extremely detailed. Living Bendy: Life with Ehlers Danlos Syndrome, which is a very realistic, honest blog about some of the immense frustrations and challenges of EDS.